The Series 1 Chrysler Hemi personified US brute HP in the 50s. And it should have, in many cases making more brute HP cube for cube than any other US brand! All Hail the Chrysler Series 1 Hemi - grandfather of the current powerhouse from Chrysler! The 1957 Chrysler 300 may have been the high water mark for the Series 1 Hemi. The 1958 model delivered the same HP. Few of us were around (or old enough to recall) the big news for 1959 at Chrysler – the Hemi was gone! Though still available in the Imperial, the big bad 392 was history, replaced by the “RB” 413. Know this, Chrysler took a lot of heat from the performance community when they dropped the Hemi in favor of the wedge big block. But the real question was why? First, we have to go back and understand the times. Wedge engines were sophisticated and combustion chamber design was far enough along that solid HP was not a problem in the non-hemi camp. Buick’s rather tame 401 made a solid 325 HP, Caddy’s Eldorado had 390 cubes and 345 HP, Lincoln showed up with 375 ponies, and a Pontiac 389 punched out 345, and many of these engines were slow turning high torque power plants. When you add in the cost of manufacture of a 392 Hemi and its cubic inch limitation, the smart move was to go wedge. Further, Chrysler noted that in 1956-57 they had 2 Chrysler engines (the Hemi and the Poly), three Desoto mills, two Dodge engines, and three Plymouth V8s. All the separate supply chain issues, the training and separate service costs – and most of all – the huge R&D costs to improve and redesign these V8s was just insane. And we must remember that Chrysler was number 3 in the big three – so reducing costs version production numbers was a priority. 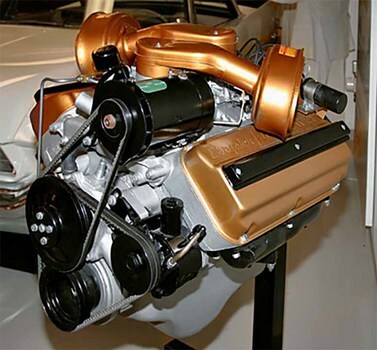 When Chrysler designed the B and the RB block, they took into consideration the Country’s appetite for large displacement engines, and made sure RB could go all the way out to 500 cubes if necessary, and the B to 400 inches. They also designed it so that it could be delivered in engine sizes from 350 to 440 with no extra cost, and could use the same cylinder heads and machining - making it an engine that could be shared across the entire Mopar line. The reduction in manufacturing costs, the ability to provide parts and pieces to all brands, virtually wiped out their huge supply-chain cost and delivery issues in one stroke. Chrysler knew its cars were sought by many for their performance, so there was the Hemi mystic and lure. From 1954 on, there was a Hemi in each brand except the lowly Plymouth. Surprisingly, however, it was Plymouth that proved to Chrysler that the wedge could make it when paired up against the Hemi. Plymouth started the ball rolling performance-wise in 1956 with their 303 cube Fury – making 240 HP when the mighty 2 4-barrel Chevy and Ford had 225. By ’57 the 318 Commando made 290 and in 1958 it pumped out 305 ponies from 350 cubes. This last iteration, the 350, was the first of many “B” series wedges to come. This block would soon become the “RB” 413-426-440 (called such because it was a raised block deck B engine). The “B” block would spawn engines from 361 through 400 cubes and become the famous 383 that powered the Road Runner. In “Long Ram” format, the 383 would be modestly rated 330 HP. The 361 B engine powered a 1960 Plymouth to 15.6 @ 90 mph. When Dodge added the 383 B to their lineup they were able to pull a 14.93 @ 91. So when the same high performance pieces were added to the RB, some serious HP occurred. Rating-wise the 413 in the ’59 Chrysler made 380 HP and 450 ft. lbs. of torque, the exact numbers delivered by the Hemi the year before. But the proof was in the pudding. The ’58 300 Hemi produced a 16.10 quarter mile @ 87 mph, and a 1960 300 F ran 16.0 @ 90 mph. When the car got lighter in ’62, Hot Rod got a 14.28 @ 100. Considering the cost issues, the availability across the entire Mopar line, and weight savings, there was just no justification for the Hemi. We know the Hemi returned on the “RB” block, but if you read carefully, you will see the justification wasn’t for those awesome drag race and street machines; it was to win NASCAR super speedway races. Frankly, if Chrysler hadn’t been so obsessed with the NASCAR venue, we likely would never seen the Series 2 Hemi – ever. Stay tuned . . . we're going to trace the history of the 300 letter series from inception to finish in an upcoming article. The "B" engine was no slouch. Here it is in 1959 with its long ram manifold working full song. 1958 300 in an attempt to get more "streetable" HP from the 392. It did not go well, reinforcing the move to the "RB". Nothing stopped Chrysler from touting their new wedge engine as seen in this 1959 ad.